Leukemia is a form of cancer that affects blood forming tissues, such as the lymphatic system and the bone marrow. Leukemia exists in many forms. Some are common in children, while others affect mostly adults. Leukemia affects the production of white blood cells. In the body, white blood cells fight infections. They usually grow and replicate in an orderly way to meet the requirements of the immune system. Leukemia inhibits this process. As a result, the bone marrow manufactures abnormal white blood cells that do not function properly. Acute leukemia. In this stage, the abnormal cells cannot function properly. The quickly multiply and grow and the disease becomes worse. Acute leukemia requires abrupt and aggressive treatment. Chronic leukemia. In chronic leukemia, the abnormal blood cells replicate slowly and may function as normal cells for a period of time. There are various forms of chronic leukemia. Due to the slow nature of mature cells, chronic leukemia produces no early symptoms initially. Lymphocytic leukemia. This leukemia affects the lymphatic tissue, which is basically the immune system. Myelogenous leukemia. In this case, the myeloid cells are affected. 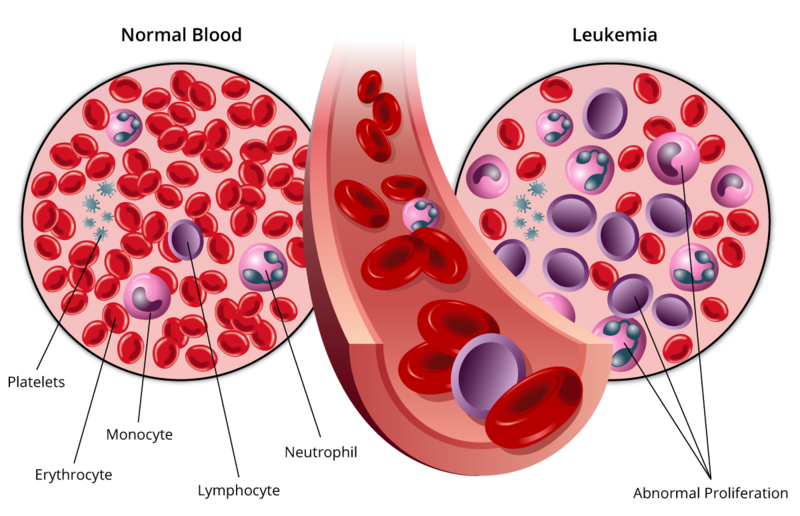 Myeloid cells produce white blood cells, red blood cells and platelets cells.